Mahlet Abebe is a board-certified Advanced Practice Nurse working in the Kennestone location for Georgia Behavioral Health Professionals. Mahlet has been working in collaboration with Dr Mihalovits providing supportive therapy, medication management and psychiatric evaluation for mental health clients. She believes in providing holistic care in way of promoting physical, mental, emotional and spiritual health. She stands ready to work with adult patients eighteen years and older with variety of mental health disorders including: Mood disorders, ADHD, depression, Anxiety disorders, and sleep disorders. She graduated from South University with a Master of Science Degree in Nursing/Family Nurse Practitioner in 2016. She also graduated with her Bachelor of Science degree in Nursing from Tuskegee University 2010. Prior to attending nursing school, she holds a Bachelor of Science Degree in Chemistry and Master of Science Degree in Risk analysis and Modelling. 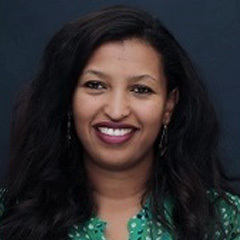 Mahlet has over 7 years of experience as a Registered Nurse and has worked with various departments including multiple psychological and physiological disorders. Mahlet is a member the American Academy of Nurse Practitioners (AANP), American Nurses Association (ANA) and United Advanced Practice Registered Nurses of Georgia.